I don't know how much you know about Modesto, but it is a pretty famous place. Its the car theft capital. Oh wait, last year it slipped to second place. Bummer. It has had its fair share of scandal. Scandal so depressing, I won't even get into it. Modesto does have a good claim to fame. George Lucas is from here. And Modesto made such an impact on him, he made a movie about it. American Graffiti. If you haven't seen it, you should watch it. It's a classic. And if you have seen it, cruising does still happen in Modesto. Anyway, before I digress too much, the drive in diner George Lucas actually went to in Modesto is still around. And this past weekend, we paid it a visit. It is amazing to think Ian was born and raised here and I spent 6 of my teenage years here and neither one of us had ever been to this place. There is still a jute box in it! A jute box that really caught Connor's attention. He just stared at it and checked it out forever. Now I will admit, the food leaves something to be desired in this place. It is all a bit greasy. But it is an A&W and they are known for their rootbeer, not their good food. In fact, Connor's kids meal was served with rootbeer. Normally I wouldn't have let him have it, but this was a special occasion filled with greasy food, so I let it slide. 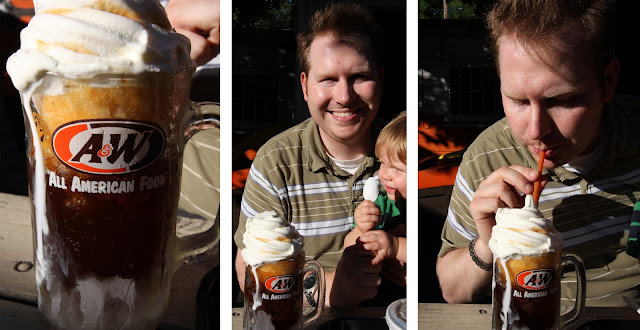 Ian got a rootbeer float. It looked good. So good in fact, that our friend went inside and got herself one. The thing I was impressed with was that even the normal rootbeer was served in the frosted glasses. Fun and amazing given that all this place is really is a fast food joint. Connor's healthy nutritious filling meal came with ice cream. Somehow it was already in his hair after one bite. That kid amazes me sometimes. Now the real highlight of the evening was the entertainment. This was something we didn't expect. You see, it was Saturday night. Karaoke night. There were people tailgating it in the parking lot. And the singers were entertaining. Not just their singing, but their attire too. The employees even got up and sang. Oh yeah, there was a stage set up in the parking lot. Remember, I said it was entertaining. If you are ever in Modesto on a Friday or Saturday evening, this is the place to hit up for some cheap entertainment. Friday nights is Elvis & Marilyn night. We may just have to go back for that this coming weekend. I've lived in Modesto for 14 years and I have never been to that A&W. I've driven by it a million times. Looks like Connor enjoyed his ice cream :) fun! I used to date someone from Modesto so that's where he'd take me home for Christmas to meet the fam... Sooo, I've heard a lot (good and bad) about it. But it sounds like you're taking it in stride with humor (you crack me up!) and exploring.